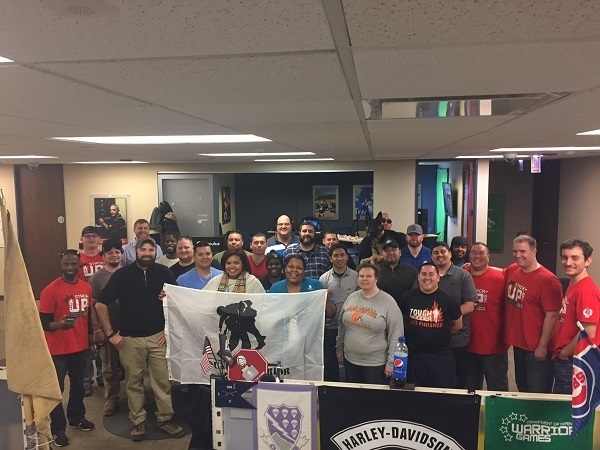 CHICAGO (Jan. 26, 2017) – Wounded Warrior Project® (WWP) recently joined forces with Stack-Up, a charity organization that brings veterans and civilian supporters together through a shared love of video gaming, to host a game night for injured veterans. While video gaming often carries the stereotype of being anti-social, for many attendees it represented something completely different. Throughout the evening, warriors snacked on food as they gamed the night away on Xbox Ones, playing Titanfall and Call of Duty®, among other games. Steven’s highlight of the night, however, wasn’t on either game – it was wearing a virtual reality headset. “We got to try the Oculus system. That was the coolest thing – I felt like I cheated on my Xbox,” Steven joked. During the evening, Steven said one encounter with a Vietnam veteran really changed his view on gaming – and staying connected with his fellow warriors. When the event was over, Steven talked with a few other attendees about the evening. He said one major element stood out – beyond the food and the fun that was shared. To find photos from this event, click on multimedia, then images, then the warrior connection and outreach section.